It’s summer barbecue season and we couldn’t be more excited. What better way to while away the warm days than with good company, cold drinks, and sizzling food straight off the barbie? If you’re playing host to a few barbecues this summer, we’ve created this Summer BBQ Series to help you take things up a notch. In this article we’ve pulled together a few tips and tricks from some of Australia’s best steak connoisseurs to help you grill the perfect steak. You’ve probably already got your own steak-grilling routine down pat, but it can’t hurt to hear what a few of the pros have to say about it, right? From grilling the perfect rare, medium, and well-done steaks to getting those mouth-watering criss cross char marks, here’s how to barbecue steaks like a pro this summer. What’s the best cut of meat for grilling? The benefits of pasture-raised beef are threefold to grain fed beef, with higher omega-3s and essential nutrients for fatty acids that the body doesn’t normally absorb from store-bought conventional beef. So head to your local butcher and try and source grass-fed meat for the first step to a perfect steak. Now, let’s get into the cuts! 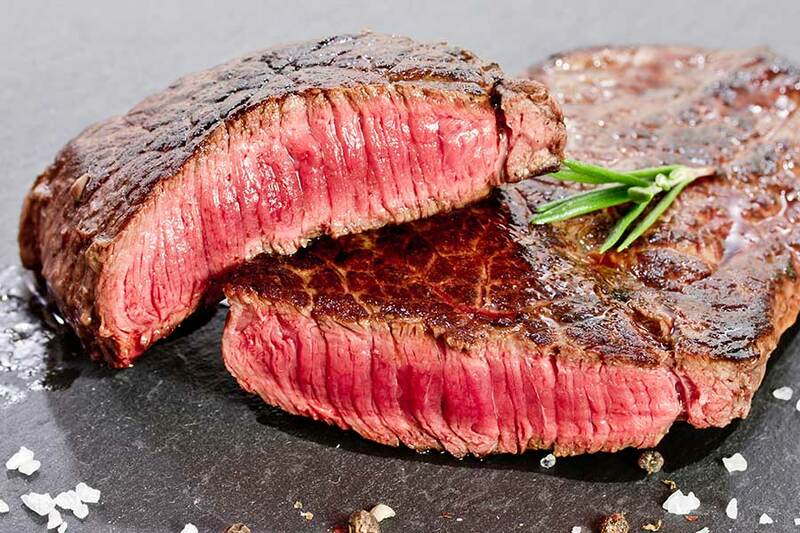 The scotch fillet is the best boneless cut of meat, with the most flavour and minimal trimming effort. Next in line is the T-Bone porterhouse steak. You can always check with your local butcher for the best availability and cuts at the time. For those with a budget-friendly desire, skirt steak is amazing but must be marinated in fruit with naturally occurring enzymes (like pineapple, papaya, and kiwi). A little goes a long way with amounts, so be careful! Only a couple of tablespoons of the fruit should be used, and you can marinade from 2-6 hours. After that, you can go ahead and add extra flavourings like paprika, garlic, soy, etc. Meat cooks better and more evenly when the temperature is the same throughout. To get the best results at your summer barbies, let your steaks rest out of the fridge until they’ve reached room temperature. 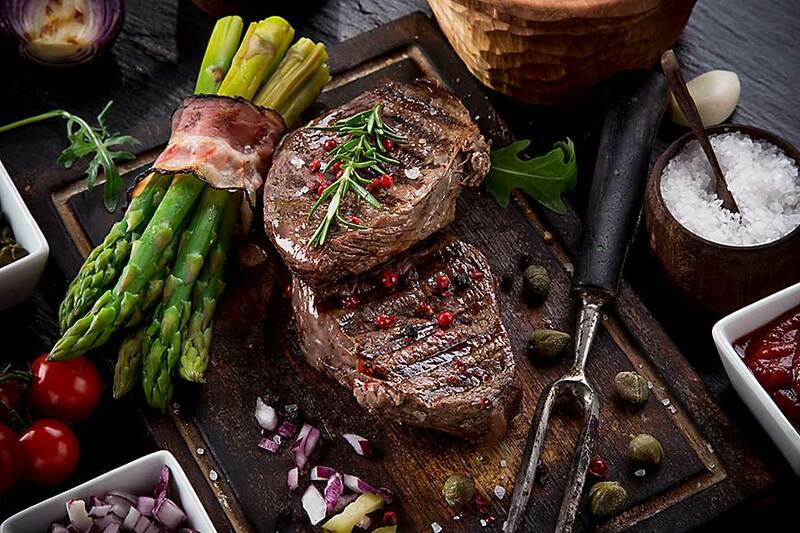 Wayne Solomon, Chief Food Analyst of Seagrass Boutique Hospitality Group (of The Meat & Wine Co) also recommends cooking steaks at room temperature. You don’t have to leave them out for hours, according to Solomon, but at least let them sit for a few minutes out of the fridge before throwing on the grill. It’s tempting to throw your steaks on the barbie as soon as you start to see smoke and feel a bit of heat, but to grill the perfect steaks you should wait until it’s sizzling hot. Letting your grill get nice and toasty is the best way to char your steaks and seal in that mouth-watering barbecue flavour. You literally want to hear that sizzle when the steaks hit the grill. Chef Joseph Webb suggests letting it heat up for around 15-20 minutes with the lid down. Use that time to sit down, grab yourself a drink, and chat with guests before attending to your grilling duties. A hotter barbecue also lets the steaks cook faster, meaning you can get back to the party sooner. Note: Putting your steaks back down in a different cooking spot after rotating is essential – the original spot will take longer to heat back up, meaning less char marks. Using this technique stops the hot barbecue griddles from charring your steaks and lets your meat cook more evenly. Turning them 90-degrees allows the steak to get exposure to different parts of the hot plate and gives you those criss cross char marks. Nothing makes you a better summer barbecue host than delivering steaks grilled just the way your guests like. If you’re not quite sure how to tell the difference between rare, medium, and well done, here’s how to do it – and how to cook each one perfectly according to the Australian Butchers’ Guild. You want to have an internal temperature of about 55-60 degrees Celsius. You want an ideal internal temperature of 60-65 degrees Celsius. You want an ideal internal temperature of 65-70 degrees Celsius. You want an ideal internal temperature of 70 degrees Celsius. Turn down the heat slightly and keep grilling until your steak feels very firm under the back of your tongs. Don’t let your guests pressure you into serving up those steaks immediately! Exercise a little patience and let them rest after grilling. After all that effort in grilling the perfect steak, the last thing you want to do is have all the delicious juices leak out on the plate. The ideal resting time will again depend on the thickness of your steak but somewhere between 5-10 minutes should be sufficient to let those juices settle. The best BBQ tip we can throw you this summer is to spend less time around the barbie and more time in the pool (with a cold drink in hand). How? By bringing in a private chef and BBQ master to do the job for you. You get to spend more time with friends and enjoy dish after dish of sizzling BBQ meats and fresh sides prepared by your chef. Have a bit of banter, learn some more cheffing tips and tricks, and kick back as we handle the clean-up afterwards. Our community of creative and passionate chefs is ready to deliver mouth-watering gourmet meals wherever you are. Backyards, picnics, party venues, and living rooms – your private chef is just a click away and ready to cook up a storm.